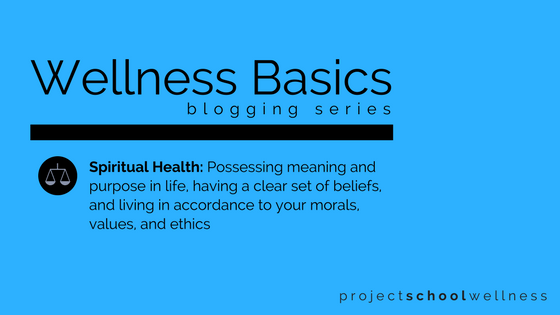 Welcome back to the Wellness Basics Blogging Series, where we chat about the basics of wellness, well-being, and learning how to thrive! This week our topic is Spiritual Health – one of the eight components of health and well-being. Real quick, let me clarify that Spiritual Health ≠ religion. Yes, the two can be (and often are) connected but they are not synonymous. Meaning, you can be religious and not be spiritually healthy and vice versa. Spiritual health refers to possessing meaning and purpose in life, having a clear set of beliefs, and living in accordance to your morals, values, and ethics. Essentially it means understanding and having a clear definition of what’s importnat in life and what’s wrong and right and living according to this understanding. Your meaning and purpose connects to what you study (intellectual), what career you choose (occupational), how you spend your money (financial), who you hang out with (social). And just think about what happens to your emotional and mental well-being when you don’t feel like you have meaning and purpose in our life. Or when you’re riddled with guilt and shame because your actions don’t align to your morals and values. Simply put, Spiritual Health is a big deal. And as teachers, it should be a primary concern in our classrooms! *As I mentioned previously, and I’ll mention again, I’m pretty positive you’re already doing a lot of this in your classroom. So the real task is to attach common understanding and language to it. Kudo cards – I use these to give students positive and specific feedback. What about you??? What are you doing to nurture Spiritual Health in your classroom??? Please share!!! I have been loving your freebies, and am waiting for approval from my district to purchase the entire curriculum! The link for this free resource is no longer working. Is this still something you offer for free or not anymore? Oh no, I’m so sorry! I forgot to update the link. It is definitely still available as a freebie. I just updated the links and you should be able to access the Mission Statement Activity. If you need anything else please send me an email at [email protected].